Simple ruck cleanout drill, with solutions to different defender arm positions. You can set these up in threes, with two players working, and one player observing and coaching. A clip of the great Aussie flanker explaining some of his technqiues. Like tackling, you need to make a decision when to add more physical intensity to your training at pre season. And like for tackling, the earlier the better. It does not need to be full bone-on-bone sessions. Better to build up the contact “shapes”, focusing on low intensity techniques. Here are five ways to “build” contact intensity. 1. Play contact rugby in an extremely small area. Say five v five in a five metre channel. 2. Use tackle shields held low to the ground to help players work on ground contact and ball placement skills. 3. Play kneeling rugby, where players move whilst on their knees. A tackle is defined as the hips of the ball carrier touching the ground. 4. Practise the last step before contact, without the run up. The ball carrier has to be in the right body position, or the ruck clearer low and ready to drive out the threat. 5. Allow grab tackles in touch rugby, or grabbing for the ball. 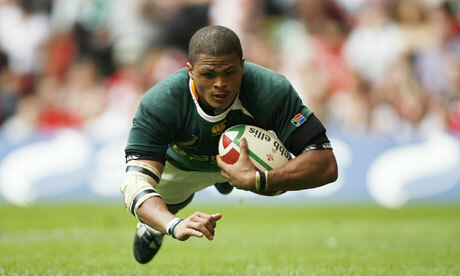 Juan de Jongh dives in for a debut try for South Africa this weekend. It was a close game, with the Boks beating Wales 34-31. Neither team were at full strength. And that is in physical terms as much as player availability. The difference between the two teams was clear though: accuracy of execution. Despite some flashes of magic and never-say-die endeavour from Wales, they simply made more mistakes than their opponents. South Africa won turnovers in the set piece and in the contact area. Gary Gold, writing in his blogs and on rugbyiq.com has made no secret of the deisre for turnover ball. Turnovers happen because the side in possession are inaccurate in the contact area or with their handling. South African Super 14 teams have forced turnover situations this season and are very adept at creating the opportunity to steal the ball. 1. Stay on the feet in contact and keep going forward. 2. Fighting the last few inches to the ground to make sure the defence has less time to compete for the ball. 3. Isolation is the fault of the support players. Some might say that the ball carrier needs to go back to his support. Actually he needs to seek space, and if he has to take contact, then he fights until the support arrives. Support players must read one step ahead of the ball carrier and be there.